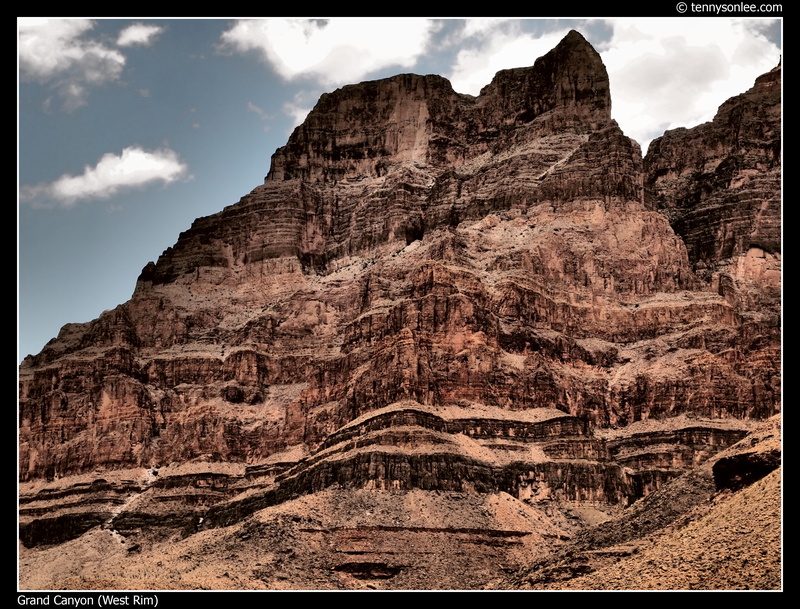 West Rim is not part of the Grand Canyon National Park. 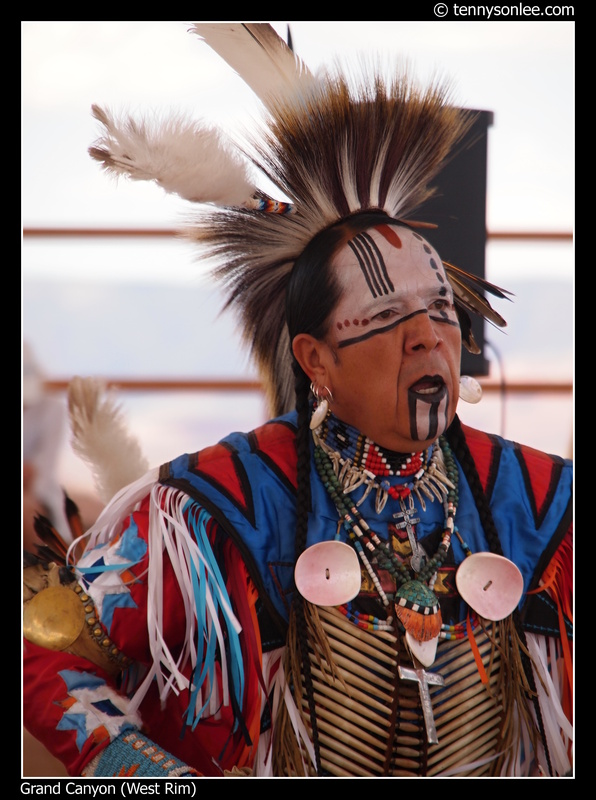 This area belongs to the Hualapai Tribe, thus public vehicles are not allowed to enter. Tourist can used the coaches managed by the tribe to reach West Rim. Since 2007, a new man-made structure had been added to the canyon: Skywalk, a transparent pathway hanging 4,000 feets above the canyon. The interesting thing is not the bridge, but the dispute between Hualapai council and the Chinese businessman David Jin. The joint venture turned sour and the lawsuit still persist. 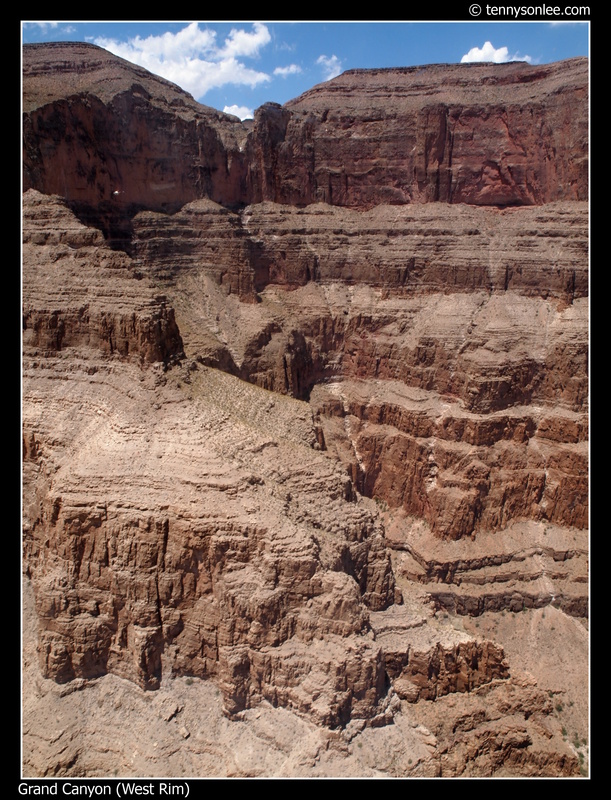 Anyway, most visitors couldn’t be bother as the Grand Canyon views are overwhelming. 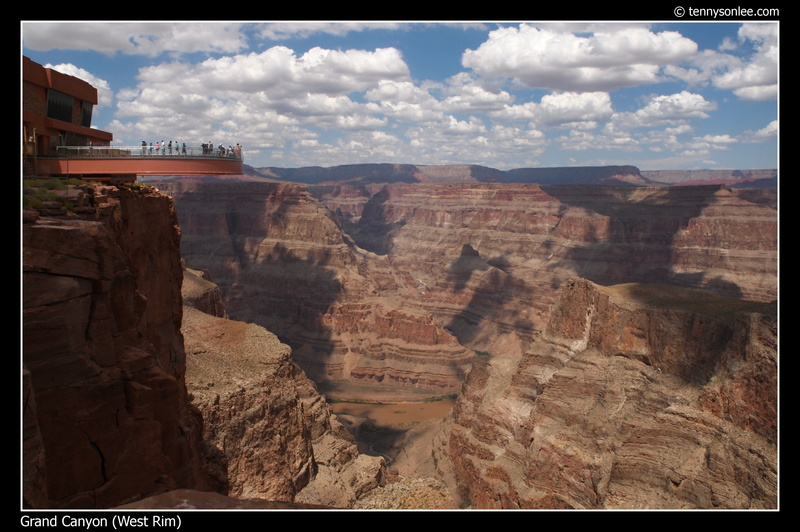 Visitors can not see Colorado River at North Rim or at South Rim. The river view can only be seen in West Rim. 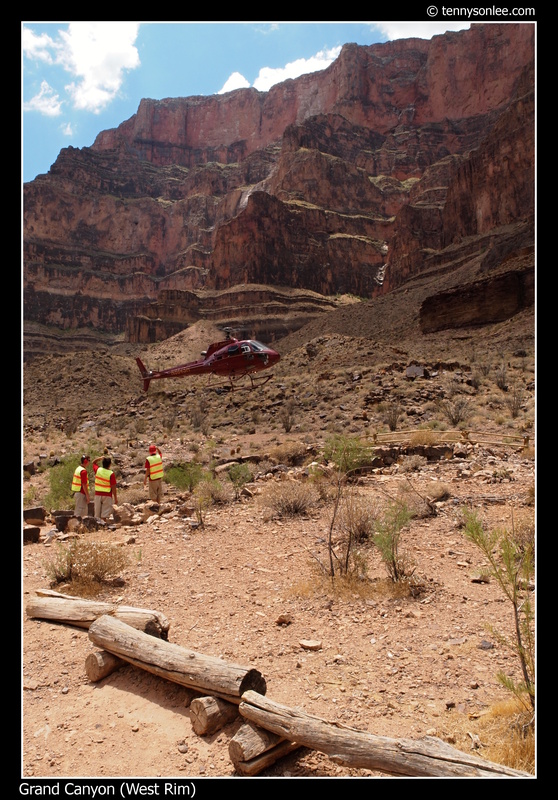 West Rim also offers helicopter ride to bring visitors down to the river bank. Grand Canyon at West Rim is 4,000 feet deep, and this is the only place for tourist to have a quick way to access the river bank. 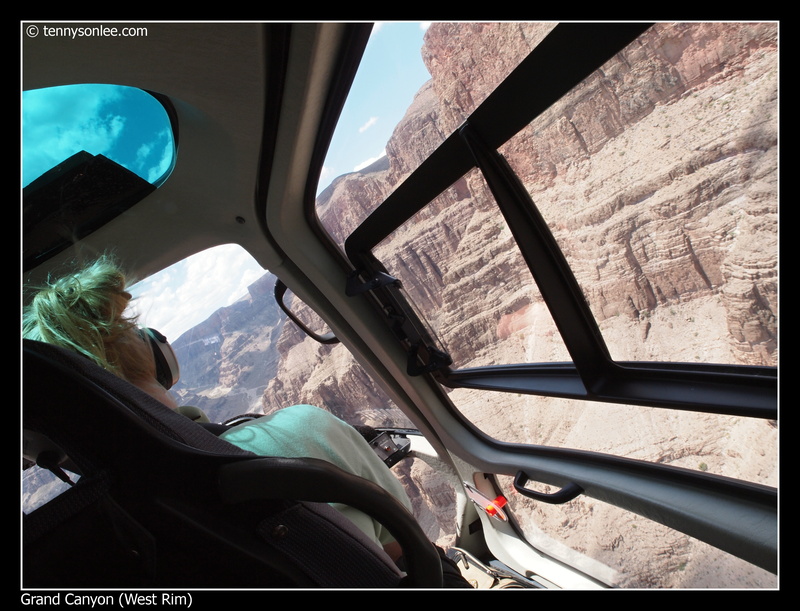 The helicopter ride in the mid air provide a bird eye view of the canyon. The short ride landed on the river bank and visitors were transfered to the river cruise. 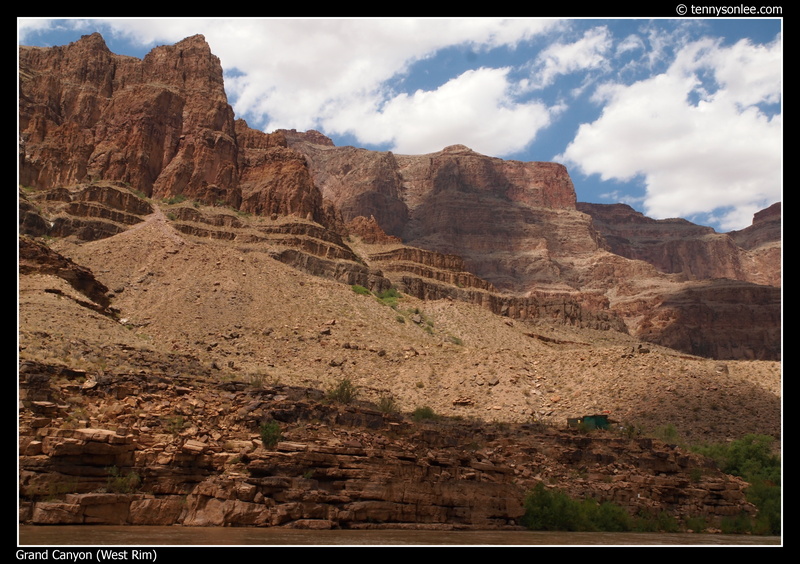 It is hard to experience the scale of GRAND canyon from picture alone. It is long and wide (446km and up to 29km wide). 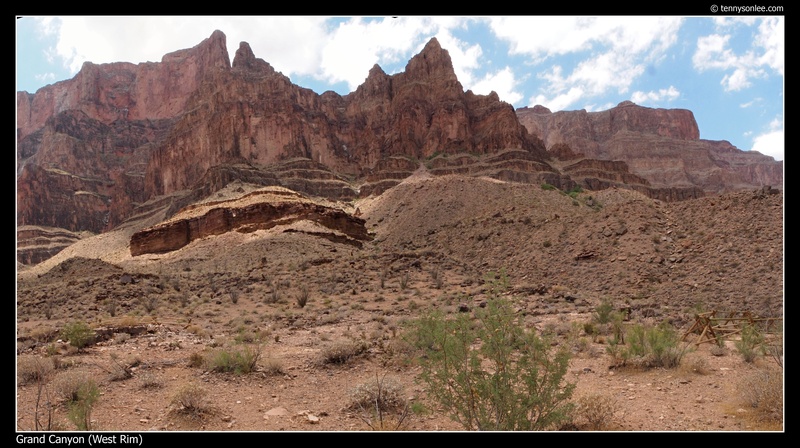 It is so far away that most of the distant canyon cliffs appear faded or washed-out. I took the following photo in mid air. Can you find the image of a helicopter on the cliff? That could suggest the gigantic size of the canyon cliff. (hint: the chopper was a tiny white dot on the top left corner). 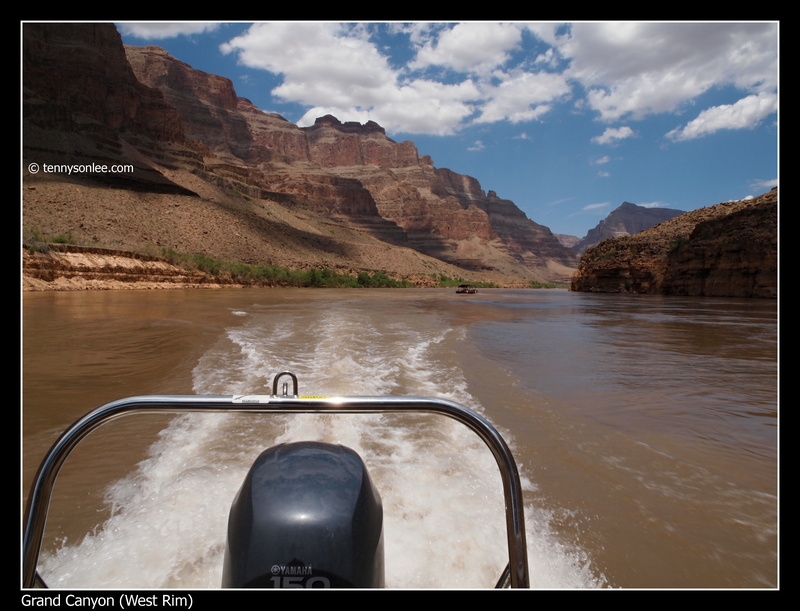 Another great experience was to be able to touch the cold water of the Colorado River. 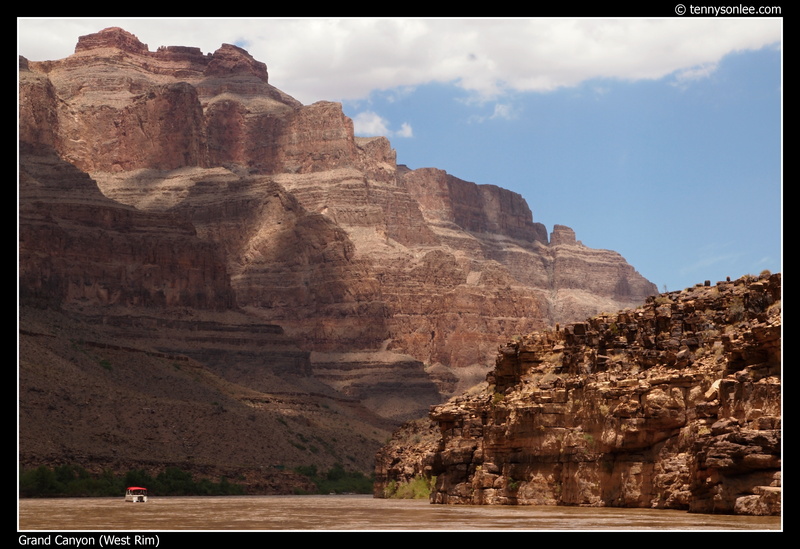 The river cruise gave tourists a close encounter with the 2 billion years old rock at the bottom of the canyon. The layers of rock were telling the ancient story, bring visitor through the time machine from modern days to 2 billions year ago. The layers reminded me the Indonesian layered cake (made me feel hungry). 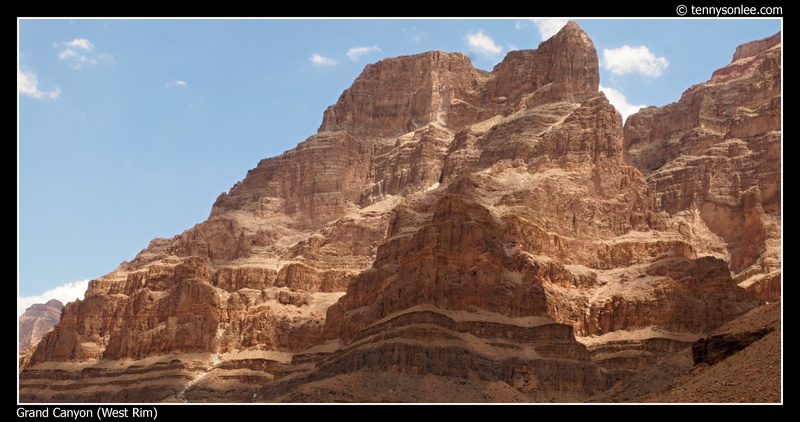 Geologists had given name to each distintive layer, like Redwall Limestone, Tapeats Sandstone, Cononino Sandstone, Bright Angel Shale etc. 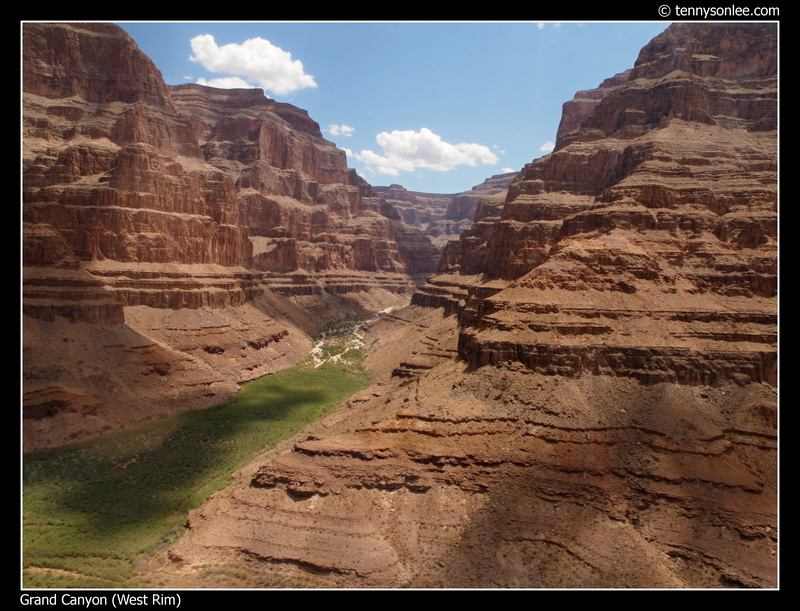 Dripping water can cut through stone, and Grand Canyon has shown that flowing river can carved out canyon that is 1 mile deep and 18 miles wide. The following picture was taken at the bottom of the canyon. Equally impressive are the views from the top. 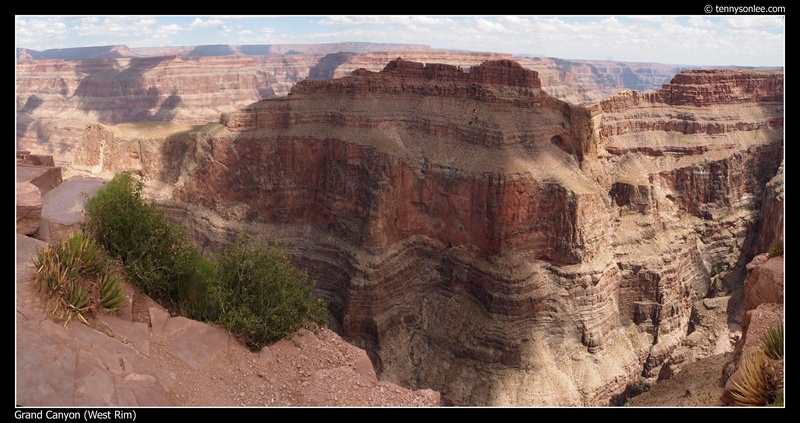 One of my goals is to be able to sit by the edge of the Grand Canyon. My dream had come through and it was indeed thrilled to hang my feet over 4,000 feet high on the vertical cliff. This entry was posted on July 7, 2011 by Tennyson. It was filed under Arizona, Landscape, Places, United States .